Nine months ago, I was living my life as usual: working, hanging with friends, going on trips, and visiting my family. I finally felt centered and genuinely happy, like I’d moved past my depression after struggling to get my mental illness under control. I’d found a routine that worked for me. Dating was on the back burner, but I’d still go through weird phases. One week I’d download all the dating apps, and the next I’d find myself feeling frustrated and delete them all from my phone. I always assumed that I’d meet someone on an app because that’s the only way I’d ever really experienced dating. Don’t get me wrong—I hoped I’d meet a guy in the produce aisle à la rom-coms, or maybe even through a friend, but I wasn’t holding out for it. It seemed nice, but not likely. Then I started dating a friend I’d known for a couple years. In time, he became my boyfriend. It’s my first serious relationship and it surprised even me, especially since I’d put all my focus on meeting a person online. Now that I’m in a happy relationship, I feel more understood than ever before, but it was easy to forget that I’d worked on myself a whole lot before entering a partnership—especially when it came to my mental health. That can be a lot to explain to another person. I’ve spent the last year and a half on my own mental health journey, and that involves talking with my therapist weekly and realizing that I’ve been clinically depressed for quite some time. After months in a deep depressive state, I took action to find balance in my life, and that included taking a daily low dosage of Lexapro. Adding antidepressants to my self-care routine has helped me tremendously. I’ve been able to work through my mental illness and finally feel like myself again—no longer held down by this unbearable, invisible weight, preventing me from even getting out of bed. I’d talked to my boyfriend about my anxiety and depression a handful of times, but only on a surface level, without sharing the intricacies and nuances of living with it. But a couple months ago, I was particularly overwhelmed and emotional due to regular life stressors, like my job, never-ending to-do lists, apartment repairs, and so on; while discussing a mundane topic with him, I started to tear up. I mentioned that I’d cried over something minor the night before, too. Concerned, my boyfriend asked, "Are you still taking your Lexapro?" I immediately became defensive. “Of course I am taking my Lexapro,” I said. Needless to say, many more tears followed. Something about his question upset me. It felt off. Later, after some time had passed, I decided to bring it up with him. It seemed like an opportunity to open up more about my depression, and about how depression works more generally. My tears didn’t mean I was depressed, I told my boyfriend. They were just normal tears, because I’m a human being who sometimes feels overwhelmed and stressed. I’m naturally an emotional person. I can’t even blame my astrological sign on it—I just am. And that’s okay. I love a good cry and have no shame in crying in public. I explained to him that shedding tears twice in 24 hours does not mean I am skipping my medication—it means I am still myself. I do understand where my boyfriend was coming from. 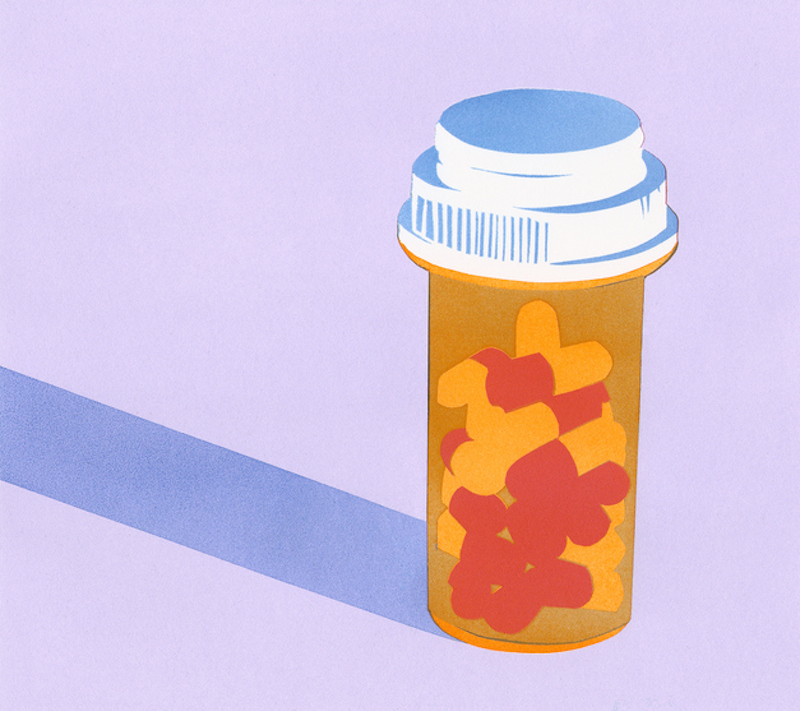 When I first started taking Lexapro and shared my mental health struggles with close family and friends, some asked how long I’d been “bummed out.” Others were unintentionally invasive, and immediately wanted to know how long I’d been taking medication. These responses initially annoyed me, but soon I realized that a lot of people just don’t know what depression looks like. We all use the word “depressed” so casually in daily conversation that it loses the real meaning. My depression looked like this: struggling to get out of bed everyday, not wanting to respond to text messages from my loved ones, smiling at work while low-key crying at my desk, and cancelling plans with friends. But depression doesn’t look one way for everyone. We’re all going through something, and it’s often much easier to put on a mask to the world—and even to those closest to you. After our conversation, I told my boyfriend that the best way to support me is to let me have my moment to cry, without judgement, and listen to me when I explain why I’m crying. My antidepressants are no cure-all and definitely don’t prompt eternal happiness; I still have my ups and downs, but I am incredibly lucky to be with someone who is willing to hear me explain how medication works for me—even if that conversation was tough to have. It’s hard to tell the people you love what you’re going through, and it’s especially tricky if it that someone is a person you are still getting to know in a new relationship. But after all the tears and conversation, my boyfriend and I are on the same page. I’m taking my mental health one day at a time, as I always have been. I just feel happy to know that now I have someone on my side—a person who is learning to be comfortable with me crying in a tiki bar and talking it out.